Rustic fruit desserts are my favorite, and I almost always order one if it’s on the menu when we eat out. (My husband likes to guess what dessert I’ll choose, and he’s usually right because my taste is so predictable.) However, unless there’s a birthday or holiday to be celebrated, or a Daring Bakers challenge to try to conquer, I rarely bake desserts of any kind at home. But the rhubarb and kumquats that were yesterday’s impulse buys at the farmer’s market got me pining for something chunky and tart and sweet and coarse and juicy and messy and perfect in its imperfection. A galette of the rhubarb and kumquats along with some of the other market bounty — strawberries and basil — seemed about right. I’m submitting this as my first entry for Weekend Herb Blogging, the venerable and popular event founded by Kalyn (Kalyn’s Kitchen) and hosted this week by Anh of Food Lover’s Journey. I think both rhubarb and kumquats are interesting enough to merit “featured plant” status, so I randomly picked the kumquats. 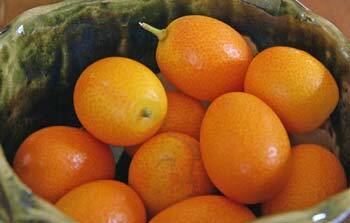 The kumquat is a diminutive oval fruit that resembles a tiny orange. It is never peeled and often eaten whole, seeds and all. The flesh is sour, the rind sweet, and the seeds bitter; I find the burst of flavors when I pop one into my mouth to be refreshing and jolting. Kumquats can also be chopped or sliced and used in fresh relishes, marmalades, meat and fish dishes, and desserts. 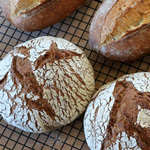 I had never cooked or baked with them before, but I’ve bookmarked some tempting recipes, listed at the end of the post. I didn’t buy a huge number of kumquats, and I wanted to have some left for snacking, so I used them as a garnish on the top of the galette only. The inspiration to candy them came from this recipe at The Kitchn, where I also got the idea of cornmeal in the crust for added rusticity. 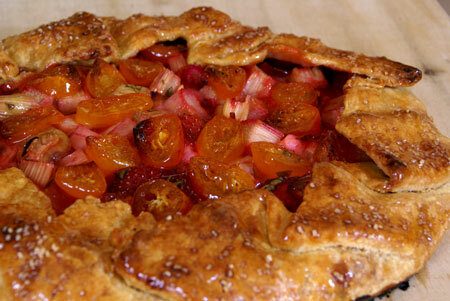 The strawberry-rhubarb filling is adapted from this one from Food & Wine. The basil was my own idea, and I could have used a little more; its flavor here is very subtle. Preheat the oven, with baking stone, to 400F. While the rolled-out dough is chilling, toss the filling ingredients together. To assemble, place the crust on a piece of parchment paper at least 10 inches square. Mound the filling in the center of the crust, leaving a 2-inch margin. 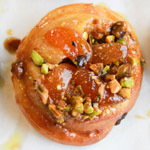 Arrange the candied kumquats on top of the filling. Fold the edges in over the filling, pleating the dough to lie flat. Brush the dough with egg and sprinkle with coarse sugar. With a peel, transfer the galette (on the parchment) to the baking stone. 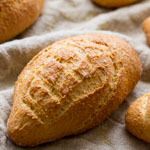 Bake for 40 – 45 minutes, until the filling is bubbly and the crust is golden brown. 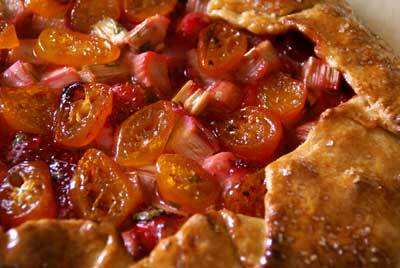 While the galette is still warm, brush the top (both crust and filling) with the reserved kumquat syrup. Great entry, and this sounds like a delicious recipe. I’m intrigued by kumquats, maybe because I rarely see them here. Lovely!! I have a rhubarb tart in the oven at this moment, and I wish I had seen your recipe before I started mine. I’ve never baked with kumquats. 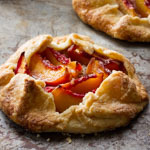 beautiful looking galette! 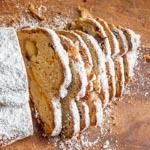 they were out of rhubarb by the time i got to the market this weekend, but i will definitely add this to the list to make! Do kumquats grow in your area or were they imports brought in to round out the farmer’s market offering? Here in Ontario, my rhubarb is only about 6 inches high. I have a couple of more weeks before I can harvest and bake. This looks amazing. What a nice combination for the filling! My mouth is watering, yum! Kalyn thanks! I’m a big fan of WHB and happy to be participating finally. Zainab & Meedo, you are dolls for thinking of me. Eileen, I’m sure your tart will be as wonderful as everything else you bake! Pollyo, I don’t have it yet. I plan to pick it up at the school soon. Mimi, I hope you find the rhubarb next time! Dana, yes, they are grown here in California (mostly southern CA but a few closer to SF also). I wish I had rhubarb growing in my yard! Farida, strawberry and rhubarb is a familiar combination I’ve known since childhood but the kumquats add a nice little kick. Gretchen Noelle, thanks! Are kumquats grown in Peru? Susan this is simply spectacular! Just had kumquats while I was in Seattle! Oh they are lovely. And I really think with rhubarb they would pair well! Strawberry too! Basil. . . all together now one – two – three – hooray!! Susan, kumquat chutney sounds great too! Tanna, I wish I had used a bit more basil, but the amount of kumquats — just on top — was about right to not make it too sour. Jen, with the kumquats already made you’re practically done! You live near me, probably we got our kumquats from the same grower. 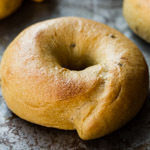 I’m with you – I’d rather have something rustic any day – especially when you have a peek at what’s inside and it has a bit of a crunch to the pastry too. Really beautiful. Susan I’ve tagged you for the 123 if you’re so inclined. I was so inspired by the basil that i put it in three different fruit pies. Thanks. Am curious about freezing galettes. 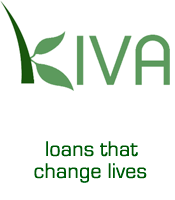 Are they good candidates? I’d presume that they’d need to be baked off before freezing? 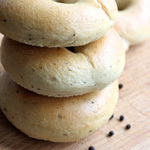 Fresh baked is always best, but there are times when you want to prep ahead. Can I make this with plums and freeze the whole thing ahead? Can’t do much last minute…too many people coming. Do plums need to be peeled?